Sauté the garlic and onion for 3 minutes, stirring constantly. Add the rice and sauté for an extra minute, stirring constantly. Incorporate the vegetable stock and white wine, season with salt and pepper, and increase the heat to high. Bring to a boil, lower the heat a little, and simmer, partially covered, for 20 minutes. Add the zucchini and red bell pepper, mix once with a fork, and keep cooking for about 10 or 15 minutes, until the rice is cooked but al dente (not mushy). In the meantime, blend half the artichokes with a little bit of water until creamy. 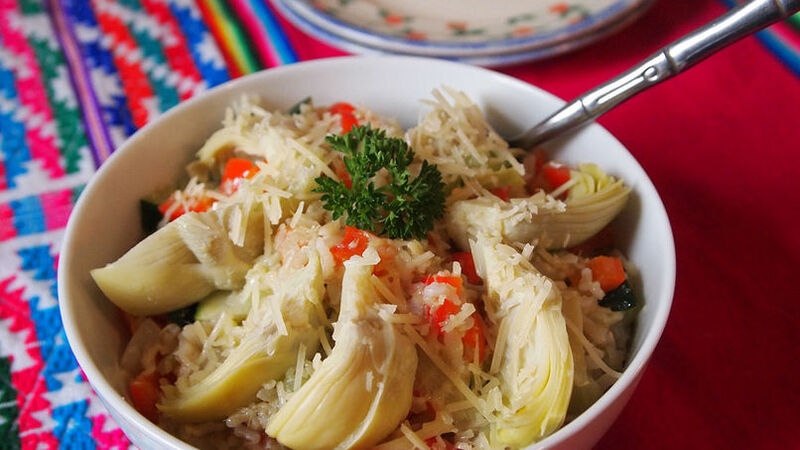 Add the artichoke cream, the Parmesan cheese and the parsley to the rice, and stir a few times with a fork. Serve in a bowl with the rest of the artichokes on top, for decoration. You can easily turn this dish into a risotto by using Arborio rice. Follow directions on package of Arborio to prepare the risotto, and incorporate all of the ingredients from this recipe. Use leftover rice to save time when making this dish. Simply sauté the onion, garlic, and other vegetables in a skillet, add them to the hot rice, and then incorporate the artichoke cream and all other remaining ingredients. I don't think there are many traditional Peruvian holiday dishes. In many ways a copy of the typical North American Thanksgiving dinner, most people eat turkey or pork for Christmas and New Years, accompanied by sweet potato or apple purée, arroz moro or another rice dish, and a big salad. Tamales are also common, as is hot chocolate (even though it's summer for us) and panetón (the Peruvian version of Italian panettone). Another tradition is to eat 12 grapes at midnight, asking for a wish with every grape, and to wear yellow underwear for prosperity in the new year. Despite being a vegetarian in a country of meat-eaters, I have always found delicious options to feast on at Christmas and New Years gatherings. As previously mentioned, rice dishes and salads (along with purées and other vegetable dishes) are almost always offered as part of the buffet; and that is more than enough to keep a girl like me satisfied. This rice with artichokes is one of the many ways in which rice can be prepared for Christmas, to make it different and celebration-worthy.